Deep Breathing: Resuscitation for the Reef (2015). Site-specific installation for COP21, Muséum National d’Histoire Naturelle, Paris. Photo: courtesy of Janet Laurence. Celebrated Australian artists Janet Laurence and Shaun Gladwell have exhibited around the world over several decades, and their work is held in prestigious international galleries and collections. The UNSW Art & Design alumni are thrilled that retrospectives of their work will be held in Sydney next year, at the Museum of Contemporary Art (MCA). The MCA recently announced the major solo exhibitions by Laurence and Gladwell as part of its 2019 program. Both artists graduated from UNSW Art & Design when it was known as the UNSW College of Fine Arts (COFA). Laurence, acclaimed internationally for her immersive installations in which she highlights environmental fragility, completed a Master of Fine Arts in 1994. Her works are exhibited worldwide, including at the Echigo-Tsumari Art Triennial in Japan and in the World Bank collection in Washington DC. Titled “After Nature”, Laurence’s MCA exhibition will feature a major new work, Theatre of Trees, which she says aims to bring our focus onto trees. The survey will also showcase some of her best-known work, including re-creations of installations such as the critically acclaimed Deep Breathing: Resuscitation for the Reef. Laurence created Deep Breathing after being selected as one of 30 artists from 23 countries to exhibit during the UN Climate Change Conference in Paris. “I feel the MCA exhibition enables me to bring together what I’ve been working with for many, many years, and that’s very exciting,” Laurence says. In addition to the recreated installations, After Nature will feature performances including poetry readings, as well as what Laurence is calling a “performative work”, Green Line, the concept for which is still being finalised. Regarding her days at UNSW, Laurence recalls her learning experiences and the people as wonderful. She has given back to the University over the years through teaching – the disciplines of painting and drawing – and various exhibits. “I felt really good about (my years there). I’ve maintained a connection to it,” she says. Among Laurence’s many honours has been a UNSW Alumni Award for Arts, and she has also been a Visiting Fellow at UNSW Art & Design. Also exhibiting at the MCA next year is London-based Gladwell, now considered Australia’s foremost video installation artist. Gladwell completed a Master of Fine Arts in 2005. Galleries that hold his works include the Museum of Modern Art in New York and Museum of Contemporary Art in Tokyo. Gladwell represented Australia at the 53rd Venice Biennale in 2009. Also that year, he was official Australian War Artist, commissioned to create artworks related to Australian military personnel engaged in their work. In 2016, he received a prestigious UNSW Alumni Award. Gladwell’s “Pacific Undertow” exhibition will include his paintings and virtual reality works. It will also feature Storm Sequence, a video of him skateboarding at the edge of wild seas at Bondi during a storm in 2000. 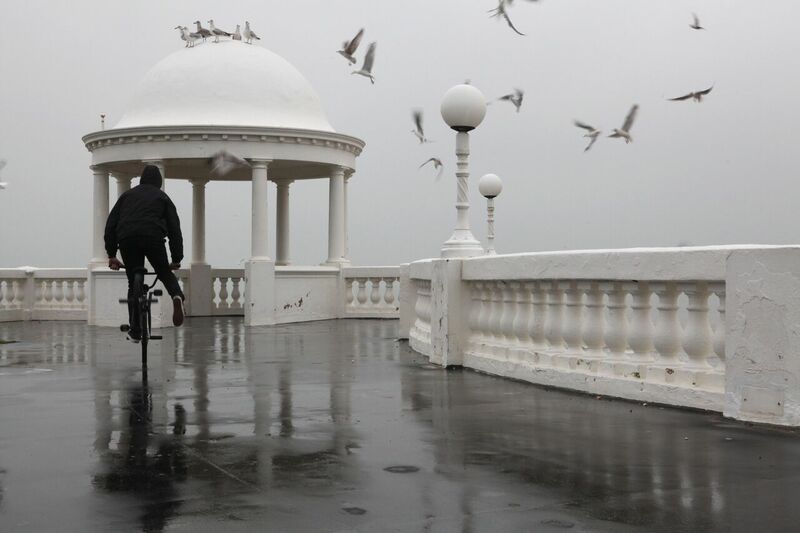 Shaun Gladwell, BMX Channel, 2013 (still). Photo courtesy of Shaun Gladwell and Anna Schwartz Gallery. “I’m thrilled to have been given the opportunity to show at the MCA , as it's quite an important museum for me, personally and professionally,” Gladwell says. “As a Sydney-born kid from the suburbs, the MCA introduced me to the work of many international and Australian contemporary artists. His time at UNSW will be represented in the exhibition by way of early artworks that were the result of intense experimentation. Gladwell says this was a time when students, mostly from COFA, organised “Imperial Slacks”, an artist-run collective of studios which operated for five years from 1997 in inner Sydney. “Instead of aiming to be discovered or validated by art museums and galleries, we organised our own venue and program,” Gladwell says. “After two decades of making and exhibiting art, it’s great to be finally staging a solo show at the MCA. Laurence’s After Nature exhibition will be held March 1 –June 10 and Gladwell’s Pacific Undertow July 19–October 7.